Coronary artery fistula is an abnormal connection between one of the coronary arteries and a heart chamber or another blood vessel. The coronary arteries are blood vessels that bring oxygen-rich blood to the heart. 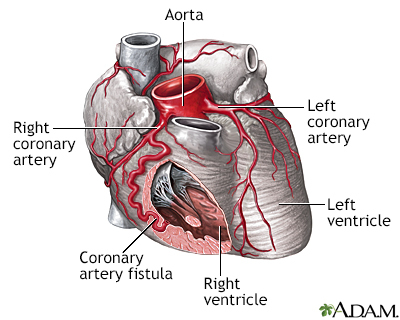 A coronary artery fistula is often congenital, meaning that it is present at birth. It generally occurs when one of the coronary arteries fails to form properly. This most often takes place when the baby is developing in the womb. The coronary artery abnormally attaches to one of the chambers of the heart (the atrium or ventricle) or another blood vessel (for example, the pulmonary artery). Infants with this condition often do not have any symptoms. In most cases, this condition is not diagnosed until later in life. It is most often diagnosed during tests for other heart diseases. However, the health care provider may hear a heart murmur that will lead to the diagnosis with further testing. The main test to determine the size of the fistula is a coronary angiography. This is a special x-ray test of the heart using dye to see how and where blood is flowing. It is often done along with cardiac catheterization, which involves passing a thin, flexible tube into the heart to evaluate pressure and flow in the heart and surrounding arteries and veins. A small fistula that is not causing symptoms very often will not need treatment. Some small fistulas will close on their own. Often, even if they do not close, they will never cause symptoms or need treatment. Infants with a larger fistula will need to have surgery to close the abnormal connection. The surgeon closes the site with a patch or stitches. 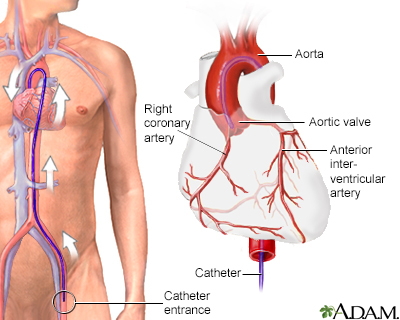 Another treatment option plugs up the opening without surgery, using a special wire (coil) that is inserted into the heart with a long, thin tube called a catheter. After the procedure in children, the fistula will most often close. Children who have surgery mostly do well, although a small percentage may need to have surgery again. Most people with this condition have a normal lifespan. Complications are more common in older people. Coronary artery fistula is most often diagnosed during an exam by your provider. Call your provider if your infant has symptoms of this condition. Ashwath R, Snyder CS. Congenital defects of the cardiovascular system. In: Martin RJ, Fanaroff AA, Walsh MC, eds. Fanaroff and Martin's Neonatal-Perinatal Medicine. 10th ed. Philadelphia, PA: Elsevier Saunders; 2015:chap 84. Kliegman RM, Stanton BF, St. Geme JW, Schor NF. Acyanotic congenital heart disease: left-to-right shunt lesions. In: Kliegman RM, Stanton BF, St. Geme JW, Schor NF, eds. Nelson Textbook of Pediatrics. 20th ed. Philadelphia, PA: Elsevier; 2016:chap 426.